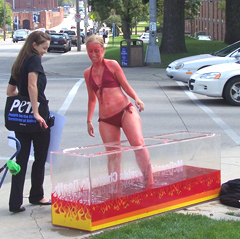 A woman from the People for the Ethical Treatment of Animals (PETA) climbed into a large aquarium filled with red water outside a McDonald’s in Des Moines today to protest the treatment of chickens. PETA spokesperson, Kristina Addington of Louisville, Kentucky, says their concern is the processing of chickens for McNuggets. She says the throats of the chickens are cut while they are fully conscious, they suffer broken wings, legs and abuse by workers. "So we are calling on consumers to boycott McDonalds until they end the worst of these abuses," Addington says. 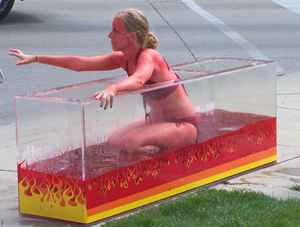 Addington spoke while Ariela Rubin of New York sat in the aquarium of red water, while wearing a bikini and red body paint. She says their request is that McDonald’s use a method called controlled atmosphere stunning, or "C-A-S" for processing the chickens. She says it is more humane method. Addington says the method is something a lot of McDonald’s in Europe are using and other companies around the world are starting to use. "As the restaurant chain that sells more chicken than any other her in the U.S., we believe McDonald’s has the responsibility as well as the ability to require the switch," Addington says. Local officials at the McDonald’s referred questions to the corporate office, which sent a statement to Radio Iowa. The statement said: "We appreciate the chance to correct the inaccuracies of PETA’s campaign, and to outline the facts about McDonald’s animal welfare practices. McDonald’s expects humane treatment of animals by our suppliers in every part of the world where we do business. McDonald’s requires our food suppliers to do the right thing – for animals, for humans, and for the environment. Our goal has always been to lead the industry by bringing about improvements in animal welfare including rigorous, ongoing audits of our suppliers’ facilities. McDonald’s works with leading independent animal welfare experts and makes decisions based upon science to promote continuous improvement in animal welfare as part of our broader sustainable supply chain initiatives. McDonald’s continues to support our chicken suppliers’ use of both controlled atmosphere stunning (CAS) and electrical stunning. There is no conclusive scientific consensus that one practice is better than the other, however, we recognize that in either method, good management practices are critical. It is also important to note that in the U.S., there are no large-scale chicken producers that currently use the C-A-S method, therefore demands to purchase chickens from this method to meet McDonald’s supply needs are not viable."